What did the Twins ever do to Mike Zunino? Last season, he hit four homers in just six games against Minnesota. Saturday night (Sunday morning?) he eviscerated a ball in the 12th inning for a walk-off homer. Byron Buxton had to leave this game after a hard collision in center field. This game recap is brought to you by the letter “v” as in it’s very late. Or “v” as in video. It was yet another frustrating night for the offense, as the Twins combined for eight hits and three walks over 12 innings. Max Kepler and Eddie Rosario had the only two extra-base hits, both doubles. Making an inning’s worth of outs on the basepaths didn’t help, either. Both Eduardo Escobar and Logan Morrison were thrown out trying to stretch a singles into a doubles and Gregorio Petit was caught stealing second . Included in the video highlights is Buxton’s collision with the wall. Actually, the worse impact was probably when he hit the ground. Buxton was checked for a concussion, but thankfully he passed all the tests. I’m sure the Twins will play it safe and continue to keep any eye on him. Hell of an effort. As has often been the case, it’s hard to find fault with the pitching. Odorizzi had a shutout going before surrendering two homers in the sixth inning and the bullpen had logged 6 1/3 innings of two-hit ball with zero walks prior to that Zunino homer. Buxton's wall crashing might be exciting, but it is also a threat to keeping his bat (what bat - 162) in the lineup.Sano had 2 BB - that was something - no Ks.Batting 198, but still he got on base.That's the summary for the big two.I think we have a problem if those are the highlights. Here are the batting averages for the starting lineup last night - no names, just averages.Look at the numbers and we are lucky to be in the Central. 238, 262, 198, 292, 269, 220, 204, 330 - I have to put a name to this outlier - Petit - want to say SSS?, 162, and two subs - 221, and 217! Twins offense explodes for 3 runs! Criminal effort in the 6th by Odorizzi giving the lead right back. Hard to fault the bullpen, this one's on the offense, again. Buxton gets hurt because he's trying too hard to make impossible plays in order to justify his place in the lineup. Bring up Nick Gordon, need some speed and some youth.This season if your going yo lose all these 1 run games and well pitched games you might as well do it with a youth movement. This lineup is putrid bad. No offense on this team. Time to get Sano out of the top of the order.He's not the threat he once was.The only hitters we have are Kepler, Escobar, Rosario.Garver now and then and Dozier now and then.You've got to keep those guys all together.Everyone else seems to have no clue or consistency other then bad!Plus, we seem to be doing little as far as small ball to help steal some runs on the few hits we get.Waiting for the long ball is getting old. By the way, Pitching has been solid. This offense just isn’t very good. We are sending out AAA level players each night in the order from spots 6-9 who are non-factors offensively and are relying on the likes of Rosario, Kepler and Escobar to carry us. They’re nice pieces but not nearly consistent enough to be the focal points of a lineup for a team that was hoping to contend for a playoff spot. It’s a miracle that we can put together 5 runs in any game considering we essentially are giving away 12-15 outs a night. My take on the offense is that Brian Dozier needs to get on one of his crazy hot streaks. Making stuff happen early in games takes a lot of pressure off everybody. Time to get Sano out of the top of the order. He's not the threat he once was. The only hitters we have are Kepler, Escobar, Rosario. Garver now and then and Dozier now and then. You've got to keep those guys all together. Everyone else seems to have no clue or consistency other then bad! Plus, we seem to be doing little as far as small ball to help steal some runs on the few hits we get. Waiting for the long ball is getting old. By the way, Pitching has been solid. Escobar hasn't been hitting either. Last 14 days he's batting .225 0 HR 2 RBI .512 OPS. His stats are worse over the last 7 days. I agree waiting for someone to heat up and jack HRs is getting old. I'd love to see more hit and runs and small ball stuff to make something happen. Did you watch Sano’s at bats last night? Two walks. 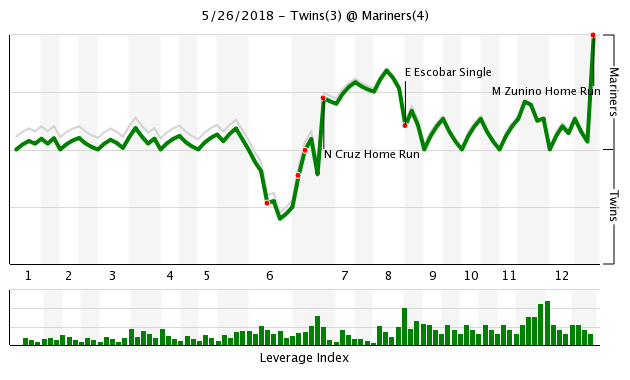 The second walk was at least 9 pitches and became the game tying run in the 8th. A drive to the left center gap and a diving catch by Gamel. 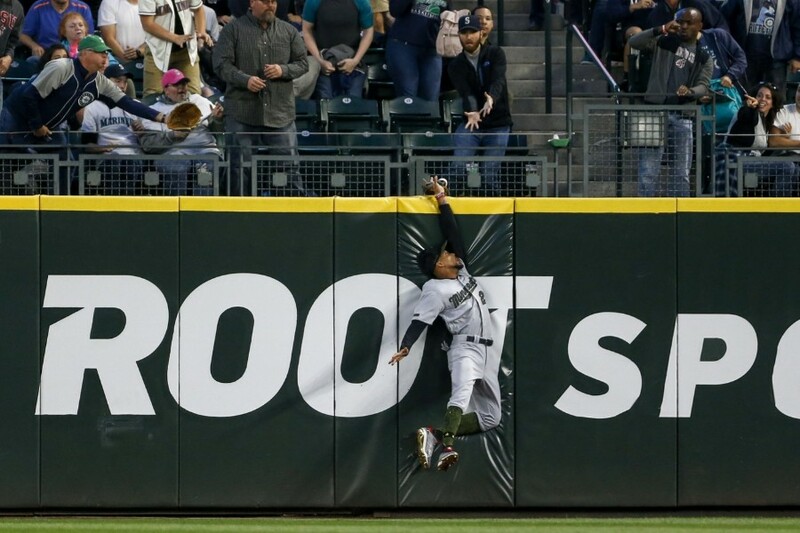 A fly ball to the wall that advanced a runner from second to third. Four very good at bats out of four. The Twins are 3-10 in one-run games and this was their seventh walk-off loss. Last season, they were 15-18 in one-run games and had six walk-off losses all year. Molitor’s decision to, yet again, wait until his starter had squandered a lead before removing him was the story of this game. Third time through the order, check. Confidence visibly eroding, compounded by infield error, check. Becoming strike zone shy, check. Manager confirms he messed up by removing pitcher immediately AFTER damage done, check. This pattern has resulted in at least half a dozen losses this year alone. And he’ll do it again, just wait. Yes, offense is the current problem for this team.But Rosario and Kepler are proving they can and will be the cornerstone of this team for a long time.Getting Mauer back will help as will Polanco, assuming he isn't totally outta whack after not playing for the first half of the season.At least he will be fresh for the drive to the playoffs in August and September. Sano isn't the hitter everyone expected he would be.Won't get into a discussion of why.Can he be someday?Maybe.Right now there are enough questions about him that they can't get what one would hope for in a trade. What did the Twins ever do to Mike Zunino? They took Buxton instead of him in the draft. Payback.!! I'm trying to recall the last time that Molitor has brought in a reliever for just one batter. I can't recall him doing that. Surely he must have at some point... maybe even frequently but I don't recall Molitor using a reliever for just one batter. Buxton gets hurt because he's trying too hard to make impossible plays in order to justify his place in the lineup. He had a bead on it. If the ball had traveled a foot less far, it was a game-saving play. I don't know if even the best judge of fly balls can pin it down to one foot - you go for it and try to make the play. I might feel differently if they were behind by 3 than with them holding a one-run lead. I would enjoy seeing a capable veteran like Torii dissect that video and maybe offer a constructive suggestion considering all factors. Zach Duke was the guy who got up first after the Segura home run. Pressly didn't get up until the error or maybe the walk and was probably not ready to face Cruz. After the home run... Seattle had 3 right handers following Segura until Kyle Seager hit from the left side. Odorizzi was at 80 pitches. I wonder if Molitor was simply stuck thinking... Odorizzi until Seager and then I bring in the lefty and kinda went auto-pilot. Also, props to Byron for obviously wanting to stay in the game, despite a forehead gash that looked like it needed stitches. The last time the Twins had more than 1 HR in a game was that comeback 5-4 win against the Angels, 13 games ago. The lineup is so obviously in need of a jolt, I just can't understand why Nick Gordon hasn't been called up. That would be nice. Brian has hit .200 with RISP and .197 with a runner on base. Not that he's had many guys on base for him to drive in, but this team is just awful at stringing hits together in general. 160 pound Nick Gordon is the HR jolt we need? That’s called regression to the norm. Anyone who thinks he is going to be a 120 OPS + hitter is deluding themselves. Mike Zunino was the third overall pick in the June 2012 draft. The Twins, if you remember, had the second overall pick that year and chose a fella named Buxton. If you could redraft, would you take Zunino over Buxton?